I really like vitamin K. I think it helps protect the heart, and it's found in a number of foods that are really good for you. Now I've discovered research that gives me yet another reason to recommend vitamin K.
For this study, published in The Journals of Gerontology, researchers examined a total of 1,089 senior participants. First, they measured the participants' vitamin K levels. Then they assessed them on a number of attributes related to their leg strength and function. These included a short physical performance battery (SPPB), a test of gait speed, and an evaluation of their isokinetic leg strength. Those who had higher vitamin K levels tended to have higher SPPB and gait speed results. They tried giving those who didn't have adequate levels a vitamin K supplement for a few years. Sure enough, their SPPB and gait scores went up. For leg strength, those who had higher vitamin K levels at the beginning had better leg strength. But supplementing didn't lead to improvements for the other group. This may suggest that it's important to maintain adequate vitamin K levels consistently for a long time. 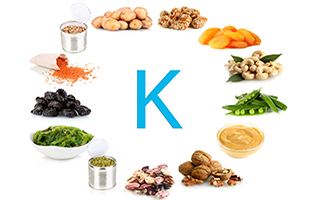 In general, vitamin K seems to lead to better lower-body function, even as we age. So I think it's important to consume plenty of it. Fortunately, leafy green vegetables, broccoli, Brussels sprouts, scallions, and asparagus are full of it.